Will I succumb to cabin fever and go stir crazy inflicting my husband with all manner of diatribes about unfeeling fascists and greedy grifters? It’s been snowing on and off since last Thursday. Most of the time I could make it into town except last Saturday when it was too icy to travel the 3 miles in to town (Yes, I’m lucky. Some of my friends must drive up to 20 miles to town). That day they closed the interstate from here to Columbus, MT which is about 37 miles. Friday night the snow and ice got serious, but the town was packed. Our monthly art show at our artists cooperative gallery was on as well as a benefit Italian dinner at The Homestead B & B. The town was also still crawling with hunters. Friend Phyllis said that it was treacherously slick coming from up the Boulder (the river valley where they shot “The River Runs Through It” and “The Horse Whisperer”), but if she said, “If I let a little bad weather stop me, I’d never leave the house and have no social life at all.” She had very fashionable high heeled boots on for the art show, but confessed she had her heavy duty boots in the car for the drive home. My friends Dave and Omi drove from Livingston (35 miles away) for the prime rib at The Grand, but he’s a Teamster. They laugh at ice and snow. Besides, there was no wind. Monday I made it to Bozeman which is about 67 miles away to have stitches taken out of my pulled tooth and to stock up on Thanksgiving supplies such as a turkey and a fennel bulb. One lane of the Interstate was clear except for a rough patch around Livingston. And there was no wind. But Tuesday, the snow began again and so did the wind. That’s when the scary whiteouts start. I grew up near snowy, windy Chicago. I went to college in Michigan and battled lake effect snow. I lived through 15 years of bone chilling winters in New York City where my car once was completely buried under yards of snow and people were cross country skiing down Columbus Avenue. But these whiteouts here are more frightening than the blizzards of wet snow in the Midwest and East. A truck passing can render you completely blind. Even without a passing truck, there is this sickening feeling as you begin to lose your sense of up and down. Even at the ranch you aren’t safe. The tales of a rancher getting lost between the barn and the house and freezing to death makes staying inside a really smart thing to do. It can be a very strange experience when there are stars in the night sky or the sun shining bright, but below the sky is all white; what is called “a ground blizzard”. 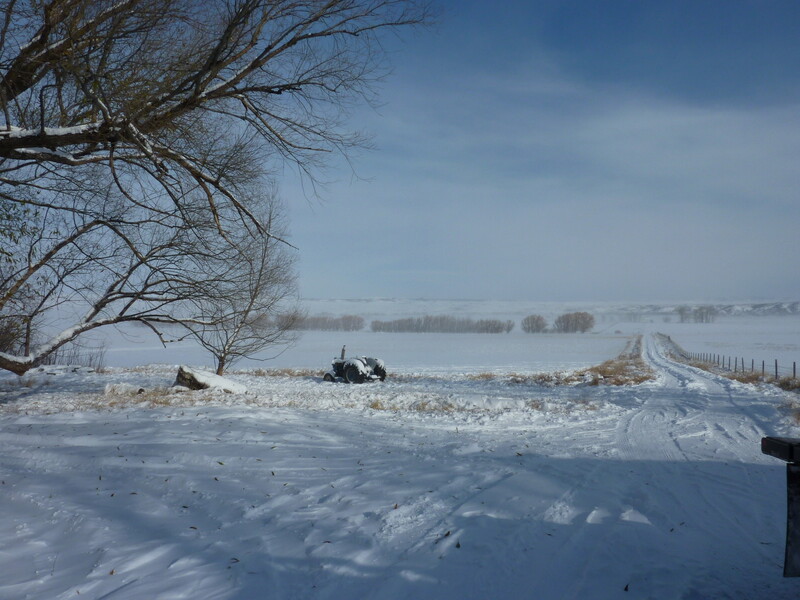 When the wind begins it blows the snow into huge drifts across the entrance to the ranch. Even our diesel flatbed truck won’t make it through the drifts. So we hunker down. But we do have two freezers filled with beef and two refrigerators filled with beer and soda. We will make it to Friday when it will warm up. We are lucky to have food and a warm place to weather the storm. Others are not so fortunate. And I worry for them. And I wonder why we have become an unfeeling country that doesn’t talk about poverty and hasn’t made homelessness and hunger against the law. We have enough homes for everybody. We have enough food for everybody. So why are some people hoarding all the stuff? Uh, oh… I feel a diatribe coming on. UPDATE: Thanksgiving day after a night of howling or more like a mighty roaring wind all night long. It sounded like a train was running past the house and what I would imagine being out in “The Perfect Storm” might sound like. On waking it was a balmy 2 degrees and rising, but the winds were blowing at over 40 miles and hour. Here is the weather alert for our stretch of Interstate 90 which looks like we have the worst part of the storm. Not unusual. This is the windiest place I’ve ever lived. It makes you a little nutty or more nutty, in my case. IMPACTS: LOCAL WHITEOUT CONDITIONS HAVE BEEN REPORTED ALONG INTERSTATE 90 FROM LIVINGSTON TO BIG TIMBER THIS MORNING. THERE HAVE BEEN NUMEROUS REPORTS OF STRANDED MOTORISTS. SIMILAR CONDITIONS ARE BEING REPORTED IN THE NYE AND FISHTAIL VICINITY IN THE BEARTOOTH FOOTHILLS. 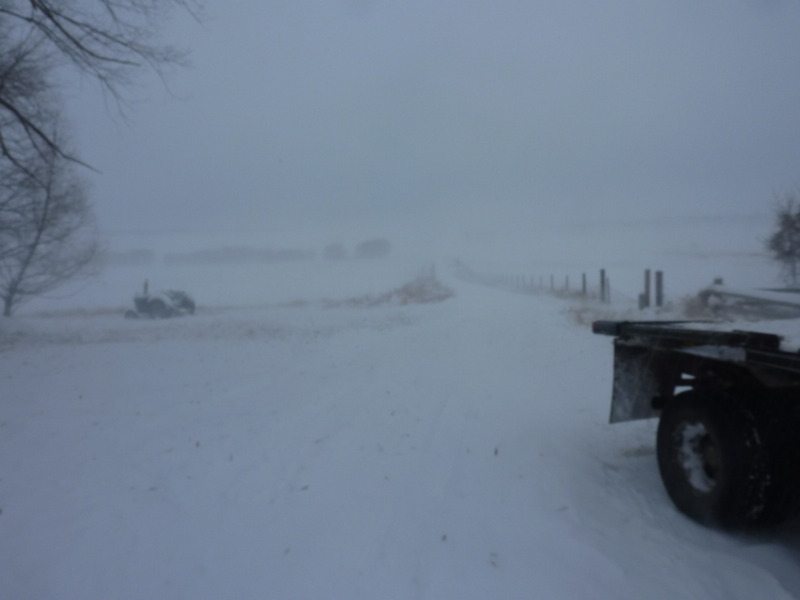 LOCAL VISIBILITY TO NEAR ZERO AT TIMES AND SIGNIFICANT BLOWING AND DRIFTING WILL CONTINUE TODAY IN THESE AREAS. HOLIDAY TRAVELERS ARE URGED TO USE EXTREME CAUTION OR AVOID THESE AREAS. AREAS AFFECTED INCLUDE INTERSTATE 90 FROM LIVINGSTON TO BIG TIMBER… HIGHWAY 191 FROM BIG TIMBER TO HARLOWTON… AND COUNTRY ROADWAYS ALONG THE FOOTHILLS OF THE BEARTOOTH MOUNTAINS. * WINDS: WEST WINDS OF 35 TO 45 MPH WITH GUSTS TO 65 MPH WILL BE FOUND ACROSS THESE AREAS TODAY. This entry was posted in Montana Life and tagged Montana, poverty, rural America, snow, weather. Bookmark the permalink. Winter comes early out in Montana! We’ve had some lake effect snow, but nothing that’s stayed around here in Northern Michigan. Snow is important business up here, the ski resorts can’t open without it and tourism is about the only industry we have. The guys that own landscaping and lawn services rely on snow plowing to survive up here in the winter, so they pray for snow too. We just hope it doesn’t snow on Fridays or Saturdays, since the Road Commission is so short on funds that they have decided to only plow state roads on weekends this coming winter. Makes staying indoors a good thing on weekends. Do you mean they only plow on weekDAYS? They have always “cut back” here. They don’t go much past 2 miles from the center of town with snowplows and especially gravel, so it’s pretty slick. This was one of the first things I noticed when I moved here 18 years ago. They didn’t have the snow removal that the cities and burbs have. There just aren’t enough people to contribute to plowing roads in the 4th largest state in the U.S. with only 975,000 people. Our county has 1.9 people per square mile.